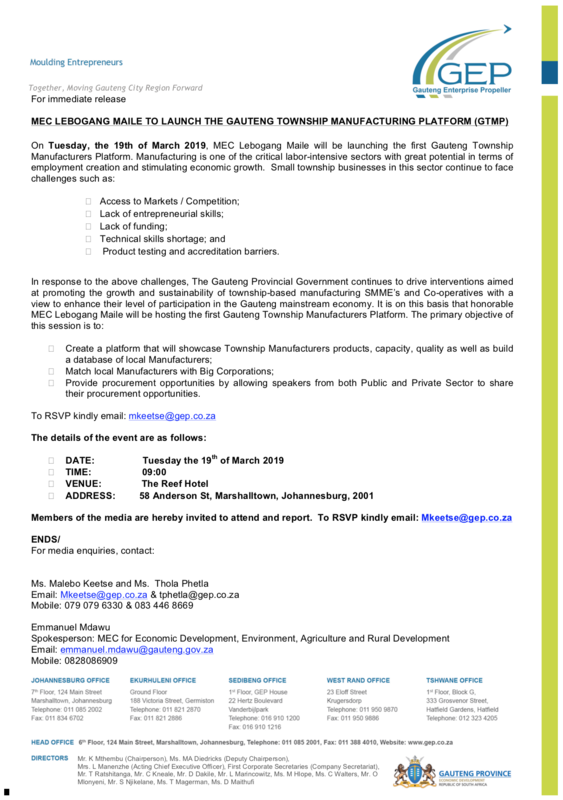 On Tuesday, the 19th of March 2019, MEC Lebogang Maile will be launching the first Gauteng Township Manufacturers Platform. Manufacturing is one of the critical labor-intensive sectors with great potential in terms of employment creation and stimulating economic growth. Small township businesses in this sector continue to face challenges. 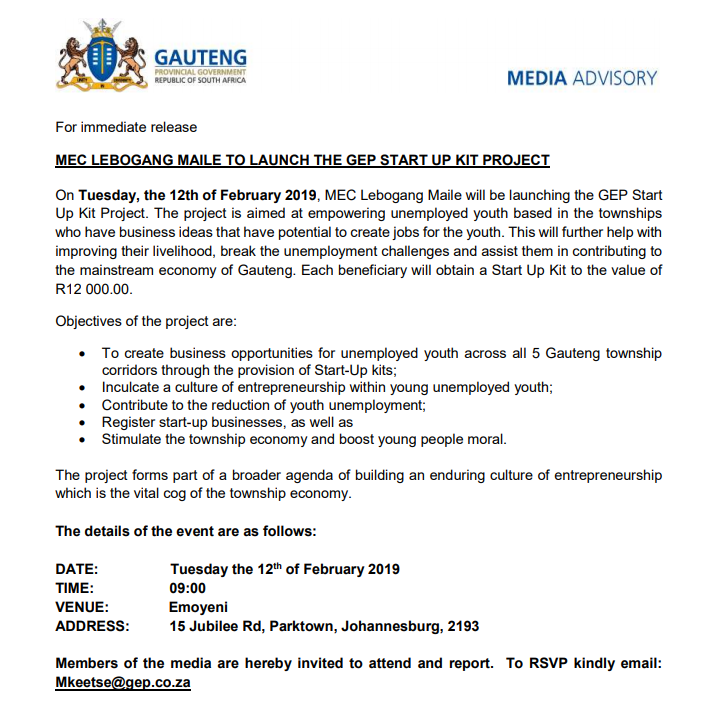 On Tuesday, the 12th of February 2019, MEC Lebogang Maile will be launching the GEP Start Up Kit Project. The project is aimed at empowering unemployed youth based in the townships who have business ideas that have potential to create jobs for the youth. This will further help with improving their livelihood, break the unemployment challenges and assist them in contributing to the mainstream economy of Gauteng. Each beneficiary will obtain a Start Up Kit to the value of R12 000.00. 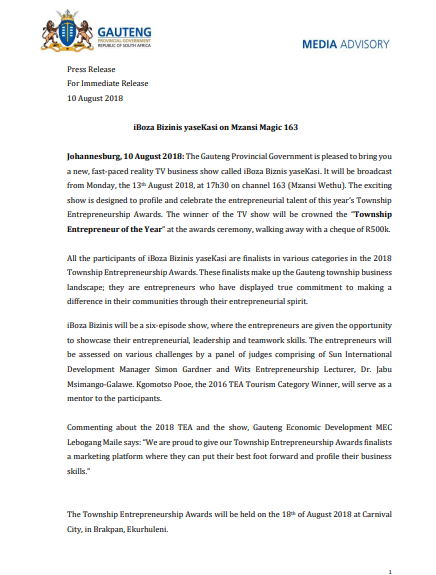 Johannesburg, 10 August 2018: The Gauteng Provincial Government is pleased to bring you a new, fast-paced reality TV business show called iBoza Biznis yaseKasi. It will be broadcast from Monday, the 13th August 2018, at 17h30 on channel 163 (Mzansi Wethu). 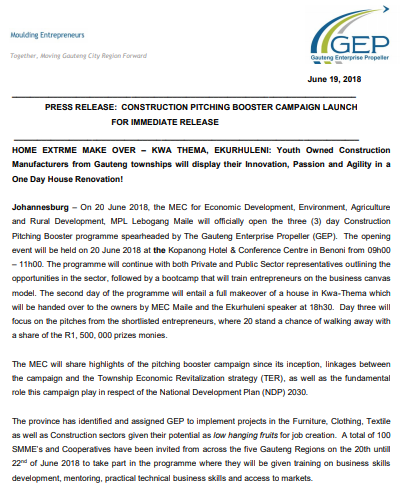 Johannesburg – On 20 June 2018, the MEC for Economic Development, Environment, Agriculture and Rural Development, MPL Lebogang Maile will officially open the three (3) day Construction Pitching Booster programme spearheaded by The Gauteng Enterprise Propeller (GEP). The opening event will be held on 20 June 2018 at the Kopanong Hotel & Conference Centre in Benoni from 09h00– 11h00. 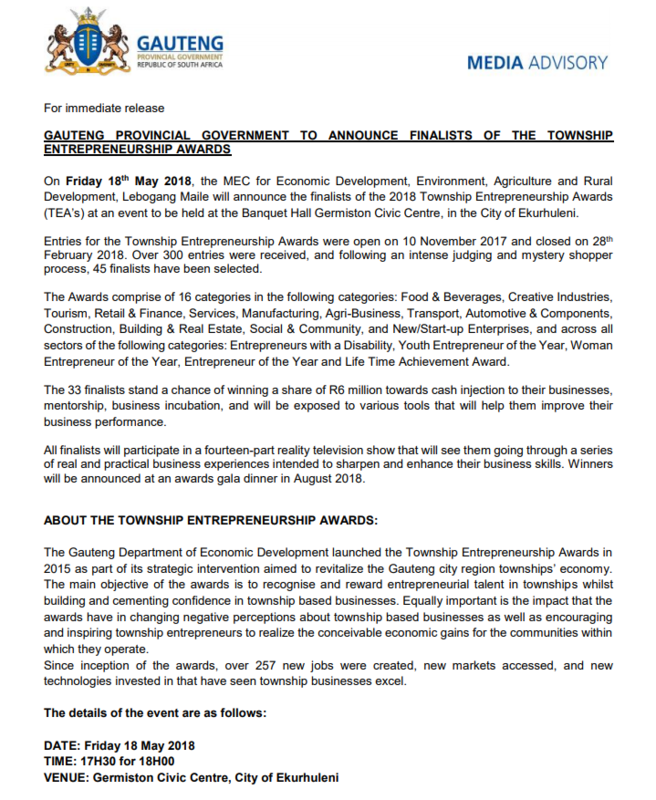 Entries for the Township Entrepreneurship Awards were open on 10 November 2017 and closed on 28th February 2018. Over 300 entries were received, and following an intense judging and mystery shopper process, 45 finalists have been selected. 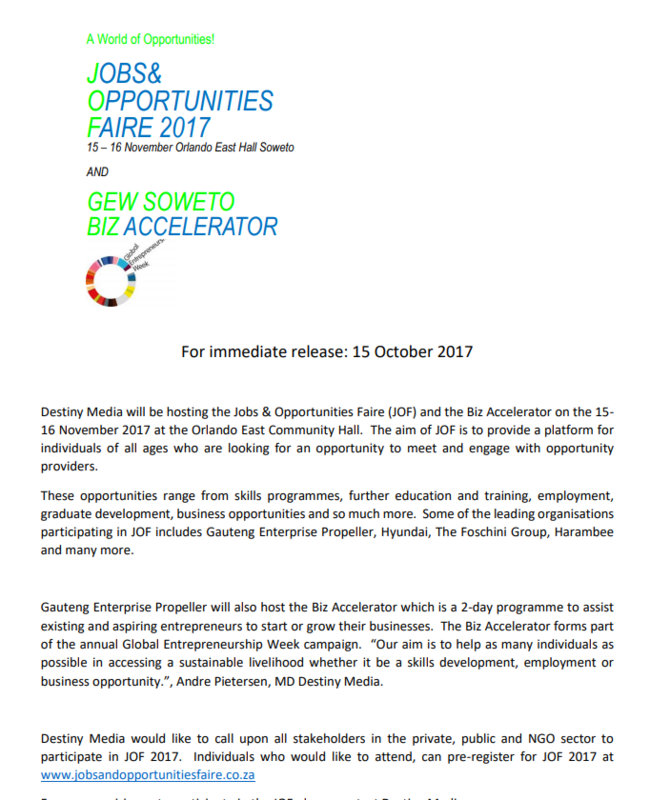 Destiny Media will be hosting the Jobs & Opportunities Faire (JOF) and the Biz Accelerator on the 15-16 November 2017 at the Orlando East Community Hall. The aim of JOF is to provide a platform for individuals of all ages who are looking for an opportunity to meet and engage with opportunity providers.